Are you a friend who doubles as a tech support to your friends and family, or just had a OS crash and are sweating with the thought of reinstalling all your basic applications or just need to quickly install VLC or flash or any such essential freeware application, then skip the vendors website and try Ninite. In case you are wondering why go to a separate site instead of just going to the respective software’s site; since you already have them memorized, it’s because it simplifies and automatres the entire process, not just downloading, but the whole installation part. Now there is no more clicking on “I agree” forms or a constant barrage of clicking the next button. And the most important part is that it doesn’t load your system with toolbars and other such adware (which now almost seems to be standard in almost all these installation packages). It allows you to get your system operational (Because no computer is operational unless VLC is installed) and ready to go. Also the collection of software they have is pretty amazing and is updated. It covers all the basic things that you or your frustrated Grandmother needs. Working with Ninite is very simple just go to http://ninite.com/ select the apps that you want from the list of categorically arranged apps. 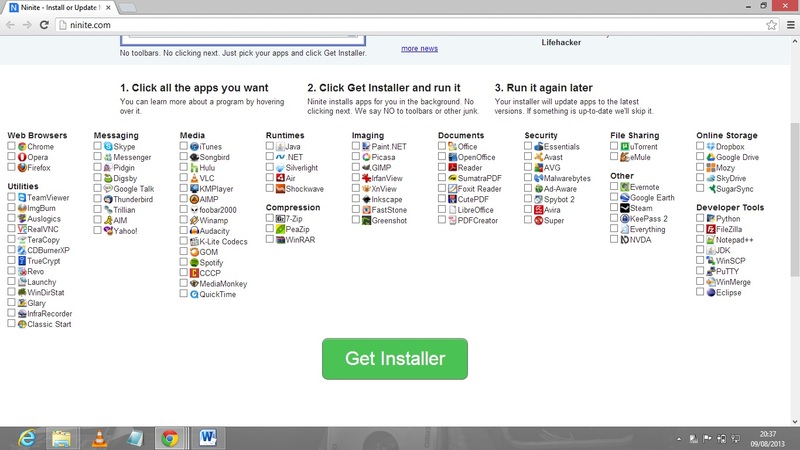 Then click on the Giant “Get Installer” button, it will take you to a new page where you can download or run a small file and then sit back and relax. I have personally used for myself and while setting up a friends computer many times and found it very useful. Also Ninite ensures as I have previously explained that no pesky adware or any other software gets installed along with it, there aren’t even any advertisements in the Ninite site and saves you a lot of time. One niftier feature of Ninite is the really simple easy to read URL that it generates, say you need to rescue someone’s software trouble from far away, you can simply copy paste the url that Ninite generates and send it to them, which they can double click and install. Ninite is has been around for more than three years now and is run by two developers Patrick Swieskowski and Sascha Kuzins, who have created this utility. It’s a very simple and one of the most useful ones that I have encountered. So stop wasting your time by staring at that installation progress window, use Ninite and chill out.